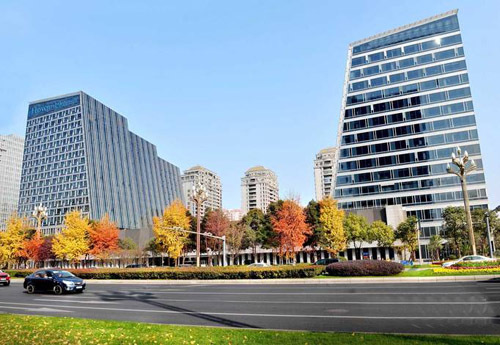 The Howard Johnson Hi-Tech Plaza Chengdu (Chengdu Gaoxin Haosheng Dajiudian) is a luxurious business hotel located in the Chengdu Hi-tech Zone, a stone's throw away from Tianfu Software Park and a good number of international and domestic enterprises. Guests enjoy convenient access to the city's Metro network, and downtown Chengdu and Shuangliu International Airport are just a 20-minute drive away. Menus at this Chengdu hotel's four uniquely-decorated restaurants and lounges offer both Western and Chinese options. Take a dip in the hotel's indoor pool or work out in the gym when you have some free time, or just indulge in the spa. Additionally, complimentary wireless Internet access is available throughout the hotel, both in private rooms and public areas.